October Spirit" is now showing at Kada. Art Critic Luke Gehring reviews Mary Hamilton's exhibit. "I do whatever it takes!" Mary Hamilton told me, "I paint what I know, and living in the country, I often find my subjects just by walking out the door and into my field or down the road. But wherever I go, I'm always looking for places that speak to me." Perhaps still best known for her watercolors, Mary was taught to paint with acrylics in college and has returned home to that medium. This exhibition, hosted by Kada Gallery is the culmination of efforts in both media. Visually, her watercolors fit into what could be called the American school of watercolor, which originally used the medium as plein air (on-site) preliminary sketches for more "serious" oil paintings completed in the studio later. That is until collectors began to see that these watercolors were great works in their own right and often more interesting than the "serious" completed works. Criteria and rules developed as to what a proper American watercolor should be, ignoring the fact that watercolor is an ancient medium and nearly every culture has had its own take on it. "And who developed these rules anyway?!" she exclaimed "I just do whatever it takes to get the image I want." Mary's watercolors do have the wet spontaneous effects of many classic American watercolors. "I put my watercolor paper up straight on my easel, and let the paint drip or run, or whatever it wants to do," she explained. But it isn't as simple as that. Along with the spontaneity of allowing the paint to do as it will, with a keen eye she imposes structure, however minimally, such as the small grove of trees in "December Fire," to keep balance between the controlled and the uncontrolled. Along with traditional watercolor paper, Mary has begun to use the new watercolor gesso to paint on canvas. Viewers who know Mary only from her watercolors may find the darkness of her acrylics startling. "I can't ever get it dark enough…You have to have it that dark in order to be able to see the light," she says. Like Ansel Adams, who found that very early morning or late evening afforded the most interesting light effects on the landscapes he photographed, Mary has found that the contrast of light and dark in those hours give her the most intriguing effects. This is illustrated by one of my favorite works in the show, "Road to Everywhere," a view of the road leading from her home on a frosty morning, with the dawn light keeping the ground dark and mysterious while illuminating the tops of the autumn colored trees. In some cases, such as "Al's Corner," she has resorted to the old master trick of starting with a dark gesso in order to keep the painting brooding and moody, rather than a white gesso, which allows the light to pass through the pigment to bounce off the gesso to give a bright and luminous appearance. The Acrylic medium allows her to become very painterly, such as with her garden as seen in "Mill Street Across the Road From the Fultons and Chaffees." Here the brush strokes become very free and impressionistic and called to my mind paintings of Claude Monet's garden at Giverny. But whereas this garden is comprised of brightly saturated color, she achieves brushy affects that are no less wonderful in "My Paradise," which is much earthier but no less rich and warm. 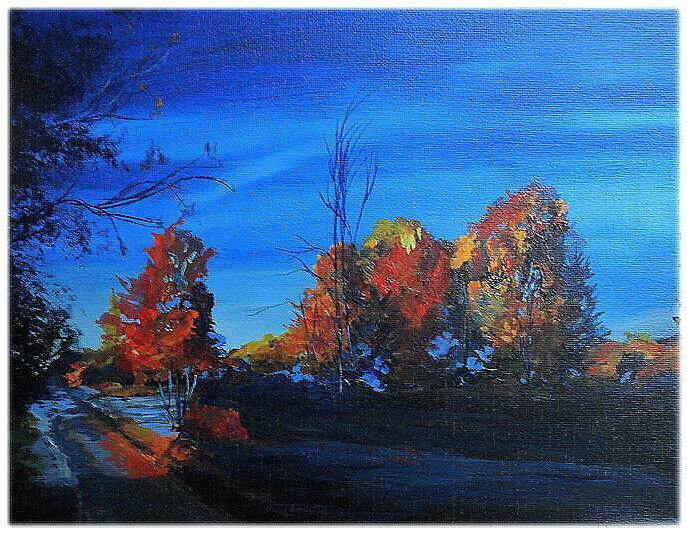 As pleasant as all these little trips into autumn and winter landscapes were, the painting that I kept coming back to was "Pymatuning Evening," which she described as being "different from all my other pieces. It has no 'fru-fra.'" Well, if it is fru-fra-less it certainly didn't need it. It is a quieting view of land and water, with clouds being the only movement in an otherwise still scene. The color of the sky captures that particular twilight hue. The foreground is kept an empty plain of darker blue, allowing the painting to breathe. And just for balance, her signature in cerulean appears there to the right. The harmonious whole of this work added a particularly poignant moment for me, in a show of many such moments. Yes indeed, Mary Hamilton did what it took. This exhibition continues Monday through Friday, 10 a.m. until 5:30 p.m. and Saturdays, 10 a.m. until 4 p.m., until November 21 at the Kada Gallery, 2632 W. Eighth St.